Region: This bug is common throughout eastern North America. Life cycle: This insect produces only one generation each year. Overwintering is performed in the egg stage. Physical Description: This bug is a yellow/green color with; you guessed it, four black lines on the wing covers. It is oval and 1/3 inch long. The nymph is bright orange with black dots on the thorax, and the narrow eggs are white and laid within slits on stems. 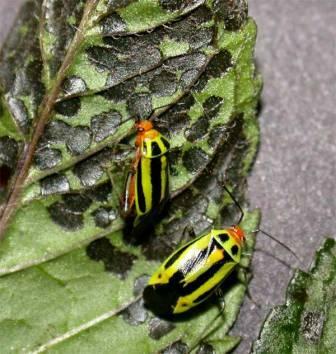 Feeding characteristics: This pest can be found on Chrysanthemum, currant, gooseberry, and mint plants. The adults and nymphs feed on leaves in the early summer, causing spots. The leaves may turn brown and fall, but the plant can handle the damage. Controls: handpicking should take care of the problem, but rotenone can be used as a last resort.